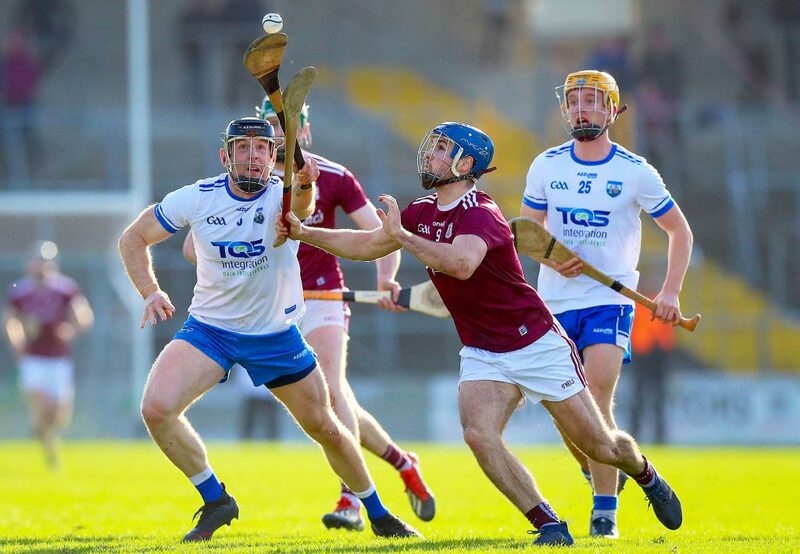 Waterford’d Kevin Moran steps in to flick the ball away from Galway’s Johnny Coen during Sunday’s NHL semi-final in Nowlan Park. Photo: Inpho/Tommy Dickson. Waterford won pretty against Clare. 31 points from 34 shots. As close to hurling perfection as it gets for mid March. Limerick had shown in the curtain raiser the damage that could be done with the benefit of that fresh breeze. Galway had that and a two-point cushion for the second-half. Only two goals were witnessed on Sunday and both were decisive. The first was a thing of beauty by Seamus Flanagan. The second was a lucky break for Stephen Bennett as his free hopped between the legs of Fergal Flannery. Waterford were hanging in there. Former minor and under 21 selector Kieran O’Gorman wasn’t too despondent when I bumped into him at half-time. “I’m the eternal optimist,” he said on his way back to the stand. Fanning was of the same mind. 5-1 was what the scoreboard said after just three minutes and 33 seconds. Stephen O’Keeffe had seen this movie before. The 2017 All Ireland final. That day it was four nil after three minutes and 33 seconds. The deep lying Galway half forwards disrupted the Déise puckouts. They won five in a row. Brian Concannon intercepted the first one and laid the ball on for Davy Glennon. Cathal Mannion caught another and Concannon pointed. Off the next restart, Joe Canning helped it on to Mannion and Glennon struck his second. It was a sloppy start in general. Waterford’s short game broke down. A high Jamie Barron hand pass to Shane McNulty saw the De La Salle defender give away a soft free on Concannon. Colin Dunford’s delivery into Stephen Bennett was struck much too hard and it bounced over the sideline. A poor strike by Philip Mahony only picked out the unmarked Canning and Glennon subsequently won a free. All these errors came in the opening fifteen minutes. There could be no complaints with 7-2. The player who should have been awarded hurler of the year in 2017 Jamie Barron maintained his high standards throughout this troubling half and arrested the slide. Galway gave away six scoreable frees between the fifteenth and 24th minute. Barron won two of those. Twinkle toes was on the ball ten times during that opening half including an early point off a Galway puckout. He cut out attacks and moved through the lines with fancy footwork suitable for the final of Dancing with the Stars. The TG4 man of the match had 16 plays in total, adding another point during the second half. His close control mystified Canning when he nipped in ahead of the man who got the nod for that precious gong two years ago. Himself and Cathal Mannion were the two magicians on show. O’Keeffe’s shot stopping is almost taken for granted by Waterford observers at this stage but his two first half saves in the space of three minutes were top drawer even by his levels. Kevin Hussey was put clean through by Canning but he acrobatically redirected the ball away from the danger zone and the umpire ultimately waved wide. Then he bravely charged out to Canning and made himself as big as possible. He clattered into Canning in the process, not the only Déise player to do so. It could have been 2-8 to 0-6 but the 2017 All Star gave his team a glimmer of hope. The free taking debate can be reopened. By the third quarter, Waterford had eight wasted opportunities from dead ball situations. Stephen Bennett was unerring against Clare the previous weekend (14 out of 14). He stood over twelve on Sunday but only scored from seven of them. The full forward pushed the boat out in the first half by taking aim from deep in Déise territory. Three drifted wide, one didn’t have the distance and one bounced past Flannery on its way to the net. He tried one short to Pauric Mahony at the start of the second half and the Ballygunner man missed. Mahony was also guilty of leaving two short while O’Keeffe also struck wide following Kearney’s red card. Waterford got away with it on this occasion because Galway were even more careless. Seven wides in a row and a 28 minute scoring famine proved their undoing. Calum Lyons, Jack Prendergast and Peter Hogan weren’t part of the championship 26 last summer. All three will surely see action in Croke Park on Sunday. Niall Burke was sent in on Lyons and he was the first Galway forward to see his number up in lights. The Ballyduff Lower man forced him into shooting wide early on and then put a block in. Davy Glennon was next. He got more adventurous as the game progressed turning up inside the 21 before that lead point from 65 metres. He made a big catch in injury time to intercept Aidan Harte’s pass across goal. A championship contender for sure. The yellow helmets lit up the second half. Jack Prendergast glided past Cathal Mannion and Padraic Mannion from the throw in before he scooped the ball over. The workaholic wing forward was involved seven times. He tackled Joe Canning to earn a Waterford sideline, assisted Thomas Ryan’s wonder point (almost a replica of his All Ireland score in 2017) and won two puckouts. Peter Hogan replaced Ryan after 51 minutes but had a hand in four points. Like the Lismore livewire, he scored off his first play. He then sprinted across the field to knock Sean Loftus off balance and win a free. He laid on the last two points for club mate Mahony. Like the free taking, Fanning has a decision to make for the final between Ryan and Hogan.